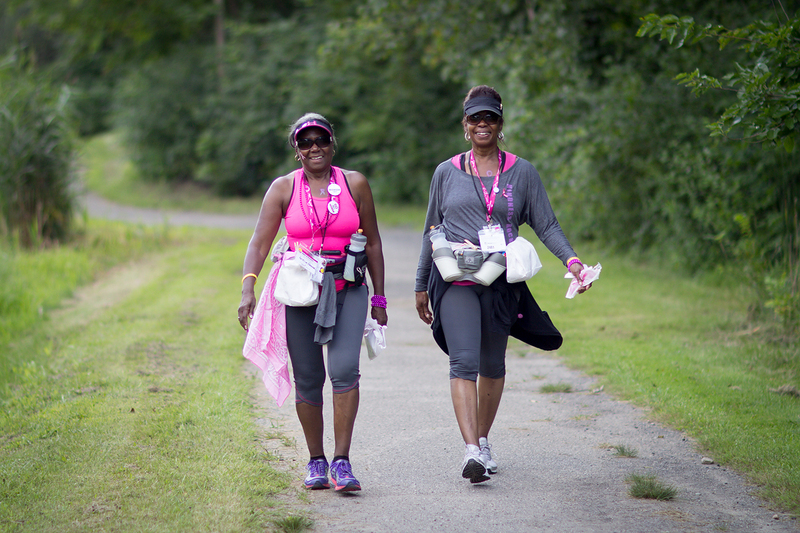 Choosing what to wear on the Susan G. Komen 3-Day® can be a big decision. Keep some important tips in mind when deciding on your duds. Layers, Layers, Layers – Each day of walking will start quite early in the morning, when it still may be chilly out. You will warm up quickly once you start moving, but we recommend that you cover yourself in layers that are easy to remove when your core temperature starts to rise. If a cold snap happens to hit during your 3-Day, you can certainly bundle yourself up a little more, but don’t wear more than you’d be willing to carry once it comes off. Not in Cotton – This cozy fabric is great for a PJs or a t-shirt to lounge around camp in, but when it comes to walking, cotton is not always the best choice, especially if you sweat a lot. Clothing made of 100% cotton absorbs moisture and holds it, so if it’s particularly hot and you’re perspiring, your comfy cotton will get wet and heavy quickly. Damp clothing leads to uncomfortable friction against your skin, which leads to chafing (no fun to talk about, and even less fun to experience) and blisters. Get Wicked – You can keep yourself as dry and comfy as possible by wearing clothing made with moisture-wicking materials. These synthetic fabrics draw moisture away from your body ( “wick” it away) and towards the exterior of the garment, which, for reasons mentioned above, is much better than having that dampness right next to your skin. Look for clothes that are a polyester blend, or check the tags for “moisture wicking” descriptions. Comfort and style can live happily together on the 3-Day! Splurge on Socks – Take care in choosing all of your 3-Day apparel, but if you can only focus on one item, make it your socks. Get socks that fit your feet snugly, but still allow you to wiggle your toes. If you like short ankle socks, make sure they’re not so short that they slip down into your shoes when you move. And absolutely heed the above advice about which fabrics to choose. You’ll also want to bring extra socks, so you can change into a fresh, clean pair at mid-day each day. Test Your Threads – Training is an essential practice for getting your body ready to walk all those miles, but it’s also a great opportunity for you to “test drive” what you plan to wear on the 3-Day. Narrow down your attire choices early on, and then train in them. If that cute pink top you picked up bleeds color, or those knee socks make your legs itch, or the shorts you love for tennis tend to…ahem…bunch up, you’ll want to know that before you realize you’re stuck in them for another 18 miles. 3-Day walkers: What’s been your favorite piece of clothing or gear to wear on the 3-Day? Let us know in the comments. I have discovered athletic compression knee-high socks at my local outfitter. They not only keep my feet comfy, the graduated compression really helps keep my legs from feeling tired, or from cramping. Mine are bright pink, too!